No less than 77 million kilos of RICE have been deliberately destroyed in Colombia to comply with a trade treaty…. Millions of tons of COFFEE are dumped into the ocean every year to keep the prices high… And the WAR ON DRUGS? 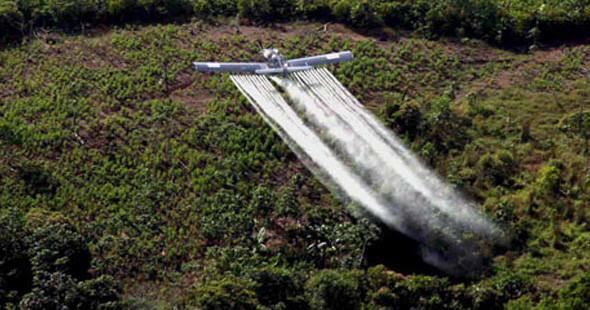 Well the picture shows pineapple crops being sprayed by planes funded by the USA… Aerial spraying of coca routinely destroys legitimate food crops in Colombia every day… Several Colombian NGOs including the association of female pineapple growers and the action board of community of Orocayo in Putumayo, Colombia, have denounced the destruction of legitimate food crops produced by the aerial spraying of coca. They underline that aerial fumigations are more of a sickness than a cure… They got that right. If you throw CHEMTRAILS into the equation, then the USA is the biggest user of Chemical Weapons and Aerial Spray Planes in the world. When you do your research, you will realise that defoliant chemicals which strip the leaves from healthy forests and crops such as MONSANTO’S ‘Agent Orange’ and the routine spraying and dumping and destruction of foreign crops are all part and parcel of the same masterplan driving us towards a total diet of GMO food-like substances.